Parrot Anafi Review + Video  How does it compare to Mavic Air ? Parrot is a well-respected name in the drone industry. In fact, I rank it really high, somewhere rather close to DJI. However, they’ve been awfully quiet in recent months. Recent year to be more precise, with no real high-end models being released. True, they had numerous variations (some would say bundles) of their bestselling Bebop 2… but those can’t be considered as new drones, not by any means. With all that being said, the announcement of Parrot Anafi and first emerging videos on YouTube really struck most of us by surprise. I mean, it’s not that Parrot had gone off the radar, but somehow we weren’t expecting a new drone from them… let alone a new drone such as this one. But come to think of it… Anafi is basically the embodiment of where the drone market is currently heading. A small, foldable drone with a top tier camera, mechanical stabilization, and smart, autonomous features. 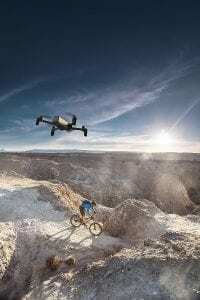 Logically, the biggest competitor will be the all-new Mavic Air… However, instead of comparing these 2 models (more on the comparison down below), we’ll first take a closer look at Parrot Anafi! So, if you’re interested in Parrot Anafi and its specifications, design, features and all that good stuff, don’t stop reading now as the fun part is just about to start! Specifications | What do we know so far? Parrot Anafi review : Camera promises a lot! Parrot Anafi drone doesn’t stray too far from the latest DJI model – Mavic Air. It boasts with a Sony IMX230 sensor bringing 21 effective megapixels to the table. This is, needless to say, quite a high number; in fact, higher than that of DJI Mavic Air. However, there’s more difference between these 2 cameras than mere megapixel count. Video bitrate is equally (if not more) important – and luckily for both of these drones, their video bitrates are standing high at up to 100mbps. That’s becuase Anafi and Mavic Air are capable of recording 4K Ultra HD videos at solid 30fps. However, DJI Mavic Air does best when it comes to lower resolution fps. More precisely, Parrot Anafi does 1080p videos at 60fps while Mavic Air does incredible 120fps. There is, however, a special trait that makes Parrot Anafi’s camera rather interesting. Well, not just interesting but useful as well… Can you guys name a few drones that come with zoom cameras? I’m sure many of you couldn’t name a single one. 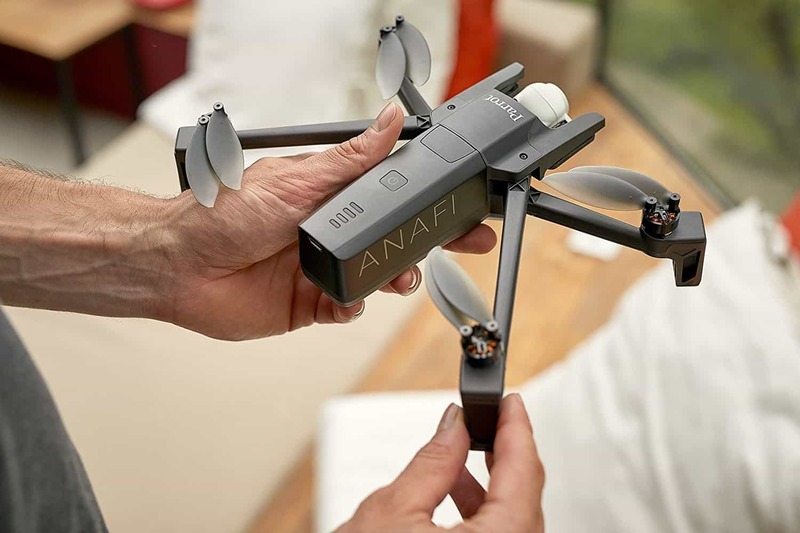 Yes, there are a few… including the likes of mainstream DJI models such as Phantom 4 and Mavic Pro… but Anafi takes it to another level. It supports lossless zooming up to 3 times, but it will take a toll on the video resolution. It’s kind of a double-edged sword if you ask me. Furthermore, what’s far more important than zoom on this baby is its stabilization. This time around, we are technically looking at a mechanical 3-axis gimbal… even though, in reality, it’s a hybrid model. 2 axis are mechanical and 1 is electronic. But that’s not the best part, not by a long shot. You see, Parrot Anafi’s gimbal has a pitch motion of 180 degrees. What this means is that it can look straight up, which is something only a few drones can do (and they cost several thousand dollars, if we’re to be completely honest here). 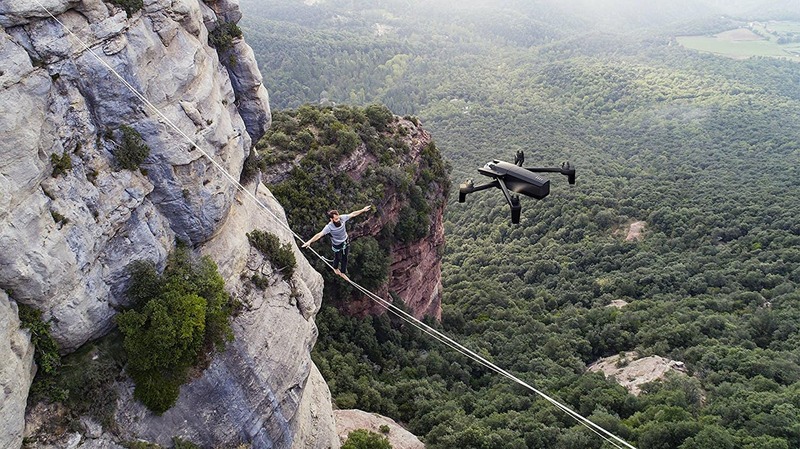 That’s all thanks to the fact there are no obstacles on top of the camera like we’re seeing with virtually all mainstream drones of today. This is a huge plus, there’s no doubt about it; an uncommon characteristic that gives drone operators a brand new shot perspective. Interesting… to say the least! 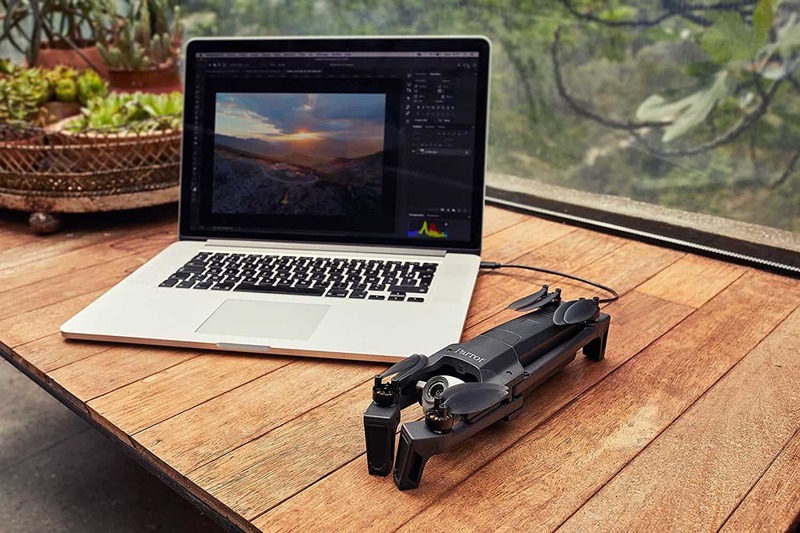 Starting off with the obvious, Parrot Anafi is a foldable drone just like its biggest competitor – DJI Mavic Pro. However, it feels much lighter and doesn’t come with a gimbal protector. It’s not a manufacturing or packaging flaw though – Anafi doesn’t need a gimbal protector since it’s protected by its front arms. As far as the build design is concerned, this thing resembles insects. Well, bees; if we are to be really precise. Moving on, the 2S 2700mAh battery snugs nicely on the top of the drone, and you it’s actually charged via USB C instead of traditional proprietary plugs. Honestly speaking, I find this to be a huge plus since you’ll be able to charge this thing with your phone charging cable if you somehow manage to lose the original one. Last but not least, night flights won’t be a blast with Parrot Anafi since it only sports a single LED down at the bottom side. Now there’s something many users already reported on – Anafi arms are too narrow… and indeed they are. They are so narrow that it might look like they will break during the very first crash. However, once you take the drone into your own hands, unfold it and start closely inspecting it, you will realize just how stiff and sturdy it really is. Moving onto the features, Parrot has really done a good job with this one. Parrot Anafi review, sort of like Bebop, has access to all the latest (and greatest) autonomous features that are bound to help it make its way to the top of the market. With that being said, you will get to enjoy the likes of dronie, orbit, follow me and even dolly zoom, which is a brilliantly implemented feature that will turn your small sketches into works of art! As far as the dedicated controller is concerned, it looks sleek but doesn’t feel so premium as the drone itself. It sports 2 sliders, 1 dedicated to gimbal and 1 to zoom. There aren’t a lot of physical buttons on it, but that’s only because the app will provide you with all the functions you will need. Talking about buttons, the first thing you’ll notice once you set your eyes on this little fella is that there’s no power button. Yup – this thing is powered on automatically once you open the top portion (the antenna). We also shouldn’t forget about some of the most basic of features that we’ve come to take for granted nowadays. GPS, altitude hold, smart return to home and geofence… all of these features are supported by Parrot Anafi. If you ask me, it’s really impressive to see such an abundance of technology and processing power crammed up in such a small drone. Best of all, it weighs less than its direct competitors while still retaining their main feats (Anafi weighs in at just slightly over 300 grams). However, there is something about Parrot Anafi that many of you won’t like at all. Even though WiFi transmission tech has come a long way in the last decade or so, drone fans are still not quite impressed with it. Still, DJI Mavic air uses roughly the same technology and is being regarded as pretty decent in terms of range. The same can be said about Parrot Anafi, with up to 4 kilometers (basically what you can expect from Mavic air too) it stands pretty well. However, keep in mind that you probably won’t be getting anywhere near 4 kilometers in urban areas with lots of interference and obstacles. The majority of people reading this will want to know all the freshest information about where can they get their hands on Parrot Anafi. Well, I’m here to bring you good news – Parrot Anafi, just like all other Parrot drones so far, will be available on Amazon as well as the official Parrot website. Don’t get your hopes up too fast though – it’s not available for sale just yet! On the bright side, there’s info on Parrot’s official Anafi page that it is scheduled to be in stock on 2nd of July. So that’s just a couple of more day (or it’s already in stock, depending on when you read this). 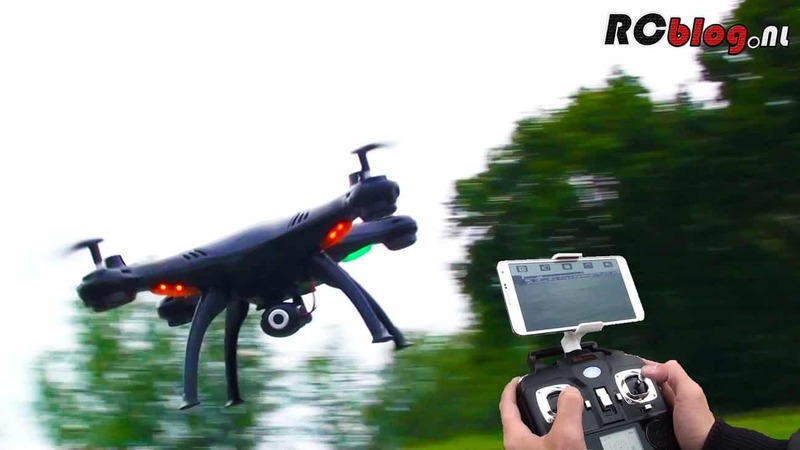 As for the pricing, you can buy Parrot Anafi for $700 which is slightly cheaper than DJI Mavic Air. Still, a more proper price comparison would be against DJI Mavic Air Fly More Combo (which is a lot more expensive than Anafi) considering the fact the basic version does not sport a dedicated controller. 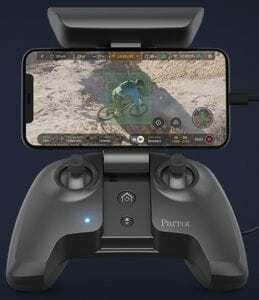 Parrot Anafi vs DJI Mavic Air – Is it too early for comparisons? Well, considering the fact Parrot Anafi still hasn’t hit the shelves, in-depth comparisons of these 2 drones are not yet possible. There are bound to be several changes (presumably in the Parrot app) before the final product, so it’s only logical to keep the comparison for ourselves… at least for the moment. 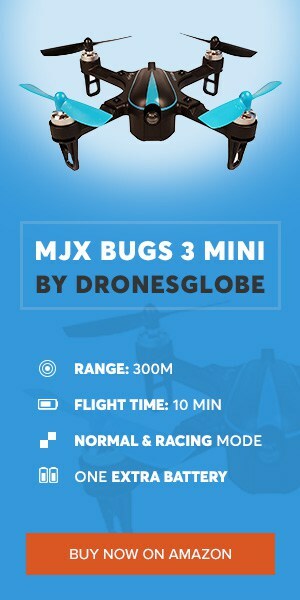 This, however, doesn’t mean there will be no Parrot Anafi vs DJI Mavic Air comparison on DronesGlobe. As soon as there’s more information available, we’ll make sure we have a dedicated comparison article waiting for you guys!